Suddenly, there's a new kid at school today. No one has lived in the Mayfair House for as long as you can remember, maybe even as long as you’ve been alive. Like a big gray toad nestled into the woods, it gazes down on the corner, eyes empty and soulless. But that’s all changed. You didn’t see the moving van yourself, but everyone at school’s talking about it. There’s a new kid in town. A story in the Storytelling Adventure System for World of Darkness: Innocents. 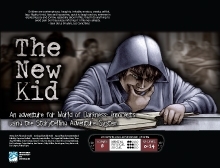 The New Kid can also be played using the normal World of Darkness rules. The file contains a number of hyperlinks to various portions of the text as well as bookmarks, so you can always jump right to what you need with just a click. This title was added to our catalog on May 12, 2008.